BARILOCHE, Argentina -- Secretary of State Rex Tillerson landed Saturday in Argentina's stunning Patagonia mountains on a mission to visit the country's largest national parks on horseback. Donning a pair of jeans, brown cowboy boots and a blue baseball cap embossed with a Secretary of State emblem, Tillerson told Argentinians at the stable that the ride would be a "treat." Tillerson met with the leadership of the national park but kept reporters away from photographing him actually ride the horse. "The purpose of the trip is ecological exchanges," said State Department undersecretary Steve Goldstein when asked why Tillerson didn't want the press to film him on a horse. He said Tillerson does not have any concern about the press seeing him on a horse. The Argentines who met with Tillerson included the vice president of Argentina national parks administration, and they discussed a potential exchange between U.S. and Argentine national parks to work together on best ecological practices, exchanges of personnel and efforts to create a healthy environment, explained Goldstein. This would fall under the State Department's cultural exchange program. Tillerson is the seventh Secretary of State to visit Bariloche. 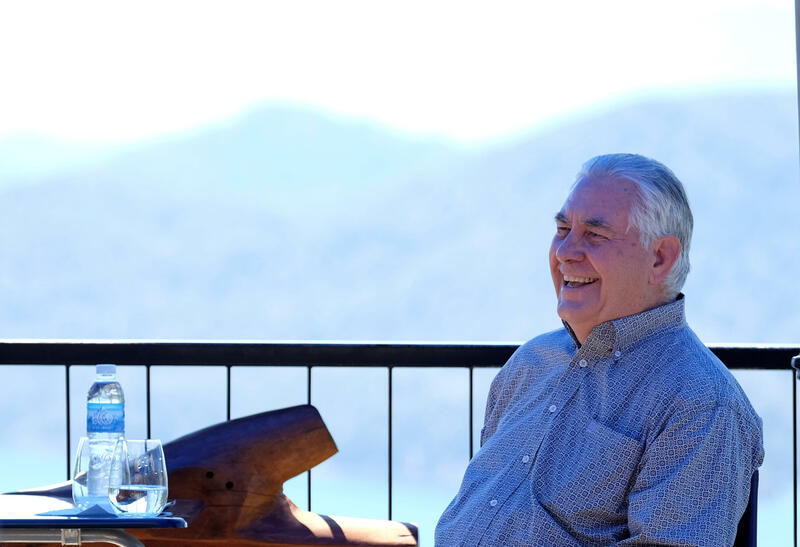 When he reached the summit of the Cerro Campanario mountain in the Nahuel Huapi National Park, Tillerson stared out at the lakes and mountains in awe. "If you are not smiling, it is your own fault," Tillerson declared with a laugh. Those who rode with him described the ride as so easy that a six-year-old could have done it, but said that Tillerson "did a little trotting." Tillerson said they discussed on the ride up the kinds of trees and invasive species. He noted the existence of mountain lions and pumas in Texas – and said it is forbidden to hunt them. At the national park, Tillerson spoke to a group of people, including an Argentine Fulbright scholar who has extensively studied invasive species and their high cost to biodiversity. "We didn't quite solve everything on the way up but we almost did," Tillerson told an aide, reflecting on his ride up the mountain. He grabbed a local dulce de leche cookie before sitting down on a porch overlooking the deep blue colors of the national park with the environmental experts. It is expected that Tillerson's efforts to visit the park will be well received by the country's government leaders. The president of Argentina, Mauricio Macri, has made an assertive effort to build up the national parks in Argentina, locals said. Emiliano Ezcurra, vice president of Argentina national parks administration said the government is "well on our way" in an effort o increase the size of the country's national parks. He explained that the country is close to approving a record year in history for national park creation. Ezcurra expressed concern about the Trump administration's efforts to roll back environmental protection policies. "It is important to be as creative as possible and find a balance between promoting economic development and not lose the species we are blessed to have on earth," Ezcurra said. He saddled a horse alongside Tillerson for a 45-minute ride, but State Department officials said the topic of the Trump administration's environmental policies didn't come up as they rode through the lush forest. Tillerson is the former CEO of Exxon Mobile, which has operated in Argentina since 2010. This was Tillerson's first event during his year-long tenure focusing solely on the environment. Tillerson's refusal to allow photos on the horse is the latest example of his private personality shining through in a very public job. He has been press-averse and deliberate to guard his personal life throughout his year-long tenure as Secretary of State. He has attended certain events without issuing a wide alert to the press because he views them as personal time – like when he gave a speech to the Boy Scouts Jamboree in summer 2017 or when he rode a motorcycle with Rolling Thunder in Washington, D.C. to pay tribute POWs and MIAs.